The Speaker Ban Law was adopted on 25 June 1963, the last day of the legislative session, after just over one hour of debate. It prohibited speeches on North Carolina public college campuses by "known" members of the Communist Party, persons "known" to advocate the overthrow of the constitutions of North Carolina or the United States, or individuals who had pleaded the Fifth Amendment in order to decline answering questions concerning communist subversion. The statute has been viewed as a conservative response to UNC-Chapel Hill liberalism in general and to the support of civil rights by university personnel in particular. Its sponsors-Secretary of State Thad Eure, drafter of the bill; T. Clarence Stone, president of the State Senate; Clifton Blue, Speaker of the State House; and legislators Ned Delamar and Phil Godwin-used an Ohio house bill as their model. The Ohio bill had been brought to their attention by Jesse Helms in a WRAL-TV editorial on 21 June 1963. After Godwin introduced the bill, the normal rules of consideration were suspended. Four minutes later, Speaker Blue declared that it had passed the House on a voice vote. The measure was immediately sent to the Senate, where Stone pushed it through in three readings and voice votes. He did not recognize anyone who wished to speak against it. William C. Friday, president of the University of North Carolina System, and the university community were caught completely unprepared for this challenge to academic freedom, but they reacted quickly. On 28 Oct. 1963 the University Board of Trustees agreed to support the repeal or modification of the law. Since North Carolina chief executives had no veto power at the time, Governor Terry Sanford appointed a special committee to review the law on 21 Oct. 1964. That committee subsequently recommended transferring control and authority over speakers to university trustees. The Southern Association of Colleges and Schools, the chief accrediting body of southern colleges, reported on 19 May 1965 that the Speaker Ban interfered with the "necessary authority" of the UNC administration and thus might be harmful to the university's academic status. At the request of President Friday, newly elected governor Dan Moore on 1 June 1965 proposed that the General Assembly create a study commission to examine the law and remedies that might be considered in a special legislative session. On 5 November the study commission proposed a compromise that was approved by the legislature in a special session. This revised law changed the ban to restrictions on speakers exercised by university trustees under strict guidelines. Student leaders at Chapel Hill opposed the compromise; they wanted no regulations or limitations on speakers. The issue heated up when the Students for a Democratic Society invited Frank Wilkinson, a leader of the movement to abolish the House Un-American Activities Committee, and Herbert Aptheker, an avowed communist, to speak at Chapel Hill. Friday tried to persuade the trustees to allow the men to appear under very strict guidelines, but the trustees refused. 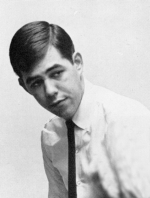 Student body president Paul Dickson III, a 24-year-old veteran, was unwilling to accept the trustees' decision and worked with Friday throughout the fall of 1964 and winter of 1965 to resolve the conflict. Once the trustees had opted for a hard line, Friday urged Dickson to begin litigation. 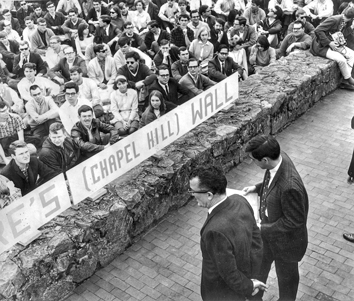 Dickson arranged for Frank Wilkinson to speak from the public sidewalk-across the university wall-to Chapel Hill students assembled on the campus side. This confrontation of 2 Mar. 1966, and a similar one when Aptheker spoke on 9 March, laid the basis for Dickson's court challenge of the 1965 revised Speaker Ban Law. Dickson, with the covert support of Friday and the counsel of attorneys McNeill Smith and William Van Alstyne, had set a legal trap for the legislature. On 19 Feb. 1968 a three-judge federal district court in Greensboro ruled that the Speaker Ban Law was unconstitutional and violated First Amendment protections of free speech. Governor Moore did not appeal the decision. On 17 May 1995 the General Assembly finally repealed the Speaker Ban Law, which had been essentially unenforceable for 27 years. Frank Wilkinson returned to Chapel Hill to speak at the UNC Law School on 27 Feb. 1997. William J. Billingsley, Communists on Campus: Race, Politics, and the Public University in Sixties North Carolina (1999). Billingsley, Speaker Ban: The Anti-Communist Crusade in North Carolina, 1963-1970 (1994). William A. Link, "William Friday and the North Carolina Speaker Ban Crisis, 1963-1968," NCHR 72 (April 1995). Speaker Ban Law Study Commission General Records, Sound Recordings, and Clippings, 1963-1968. State Archives of North Carolina. http://www.ncdcr.gov/Portals/26/PDF/findingaids/pdf/sa_speaker_ban_law_study_commission.pdf (accessed November 1, 2013). Banned speaker Frank Wilkinson (left) is introduced by student body president Paul Dickson from a public sidewalk on Franklin Street as students seated on the UNC campus listen, 2 Mar. 1966. Photograph by Jock Lauterer. North Carolina Collection, University of North Carolina at Chapel Hill Library. Paul Dickson III, UNC Student Body President, fought the Speaker Ban Law. Image courtesy of UNC Libraries. 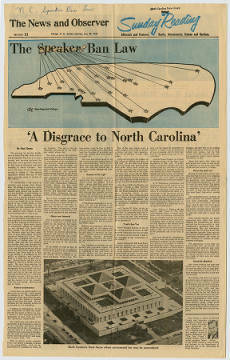 Available from http://www.lib.unc.edu/mss/exhibits/protests/catalog67.html (accessed July 31, 2012). Raleigh News and Observer. "Speaker Ban Law." Series of Photographs. Flickr. State Archives of North Carolina. http://www.flickr.com/photos/north-carolina-state-archives/sets/72157633220829534/with/8639149151/ (accessed April 11, 2013).